It is ridiculous to me how many people haven’t tried shakshuka before. If you haven’t, try making it. 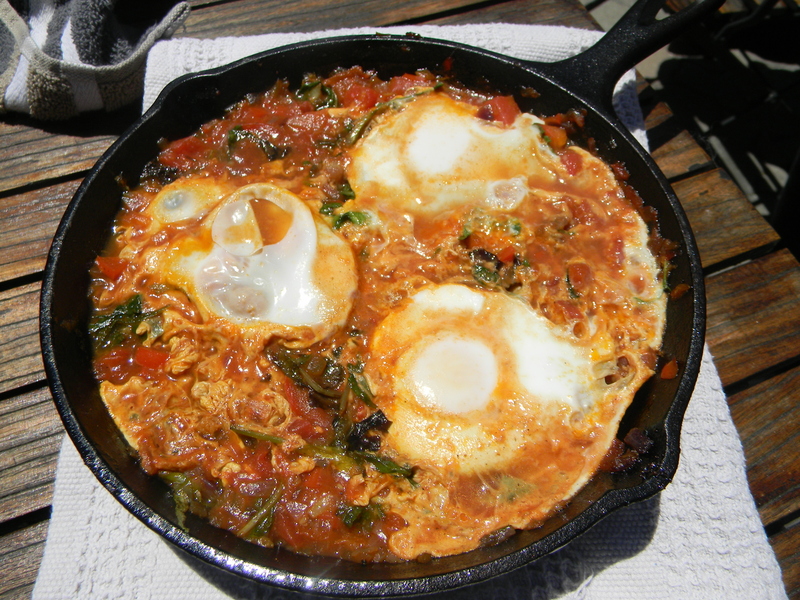 Shakshuka is eggs poached in a spicy tomato sauce, and even though I refer to it as shakshuka, it is cooked in many different cultures under various names. You can use bell peppers and cumin to make it traditional Israeli Shakshuka, add basil and parmesan cheese to make an italian Uova in Purgatorio (eggs in purgatory), add black beans and some avocado to make a Huevos Rancheros inspired dish, or use a mix of all three using whatever you have on hand to make it your own. I personally love shakshuka because all you really need is tomato sauce, eggs, and maybe some sort of cheese to go on top. 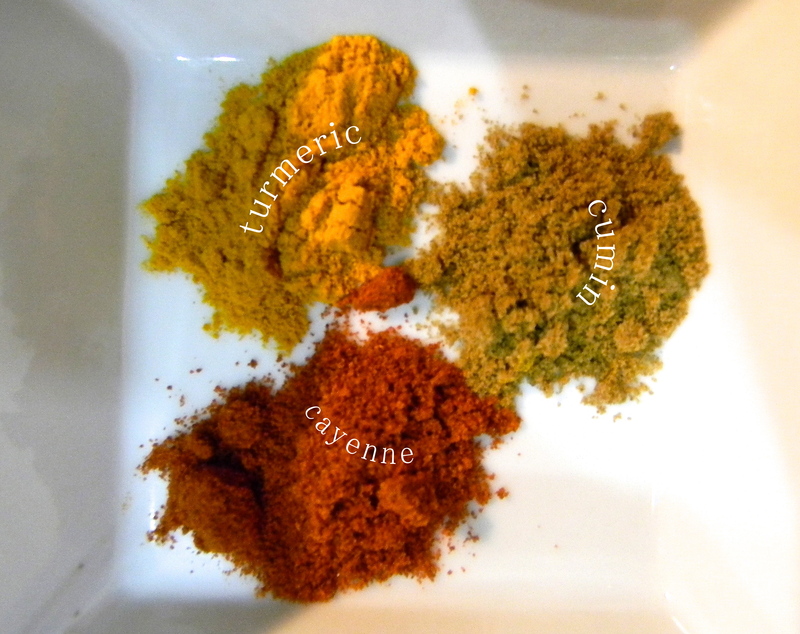 I always have cumin and other spices around, so I often will use the Israeli inspired spices, but add basil and parmesan on top, because that is what I tend to have on hand, and it yields an amazing product. Or you can make a super non-kosher variety like I did today and cook everything in bacon fat. The bacon fat and small bacon pieces did not overwhelm the dish at all, but added another layer of complexity to the dish and made it extremely delicious. But of course, it tastes amazing vegetarian as well. 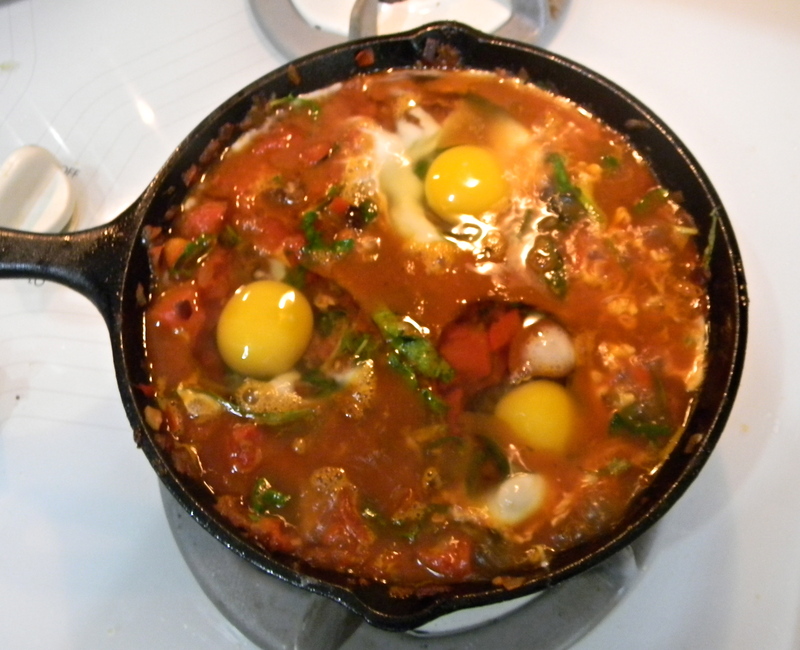 I made shakshuka a week or so ago to put on the blog, but the pictures turned out horribly so I discarded that attempt. I really care about this recipe and make it at least 1-2 times a month, so I want it to look good and for people to want to make it. Anyways, like a crazy person I decided to put off packing for Japan (I leave tomorrow.. or err today) and spend a good 2 hours cooking shakshuka today. It really doesn’t take 2 hours, but with pictures, lighting problems, clean up, and eating this was a 2 hour ordeal. To add another layer of crazy I am writing this blog post at 3 AM on the day of my flight. I mean I have mostly finished packing so it should be fine. I have also realized that my camera is not good enough to take quality photos at night, so I have to beat the day light if I want good quality photos. Maybe that is a good thing because I tend to cook elaborate meals at like 1 AM, and although I like to think that I am doing my family a favor by filling the house with delicious aromas, my parents who wake up because they smell garlic and onions in the middle of the night would beg to differ. Anyways, I have been reading Michael Pollan’s new/old book ‘Cooked’ and it is really a fascinating read. I personally skipped over the 1/4 of the book dedicated on how to whole roast a pig, because quite frankly I don’t plan on doing that any time soon. The chapter on water and stews, however, was fantastic. He talks a lot about this chef he met in San Francisco named Samin Nosrat and mentions all of these cooking terms and techniques that I had never even heard of. It made me realize what a young little scrub I am when it comes to cooking, so obviously I took extensive notes on everything Samin had to say. I actually took a notepad from where I work to take notes, and that is now where I write down any new things I learn about cooking. I specifically learned a lot about mirepoix and soffritto, two very similar bases to french and italian cooking, respectively. Mirepoix is a dice of onions, carrots, and celery in olive oil, while sofrito is a mince of onions, carrots, and celery in olive oil. Interesting right?! I thought it was. I took notes on it for heavens sake. 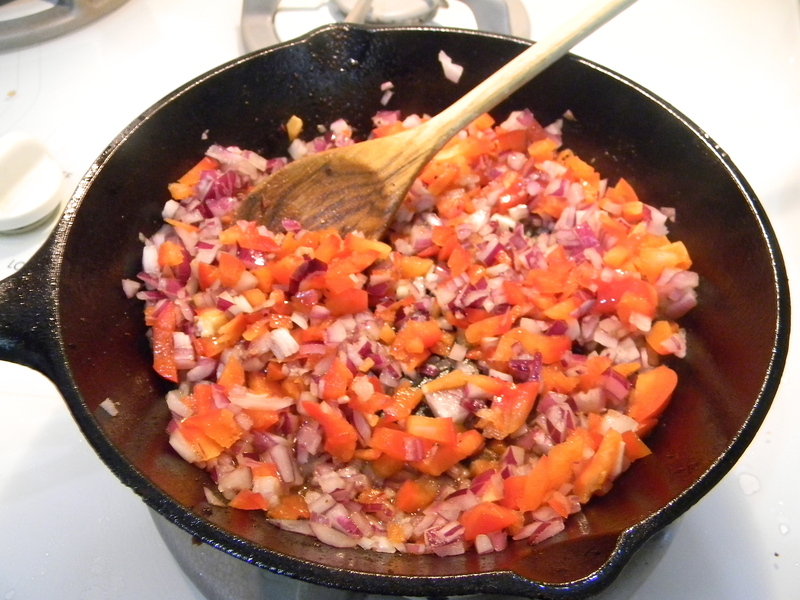 In this dish, I used a fine dice of red bell peppers, onion, and garlic, which I believe is referred to as the “holy trinity” of Cajun cooking. Their version of mirepoix. Actually I believe its celery instead of garlic, but maybe garlic is sometimes added? I don’t know, I left my notes at work on accident. Either way, I was very excited to practice my fine dicing skills with this mirepoix of sorts. I have considered emailing Samin multiple times. Mainly because I live so close to SF and feel like I could meet her one day. But what would I say? “hey I have a food blog. Can you teach me how to cook? Can I watch you cook?” Either way she teaches cooking lessons and I am going to try and get on that when she starts them again. Ok see you in 2 weeks! 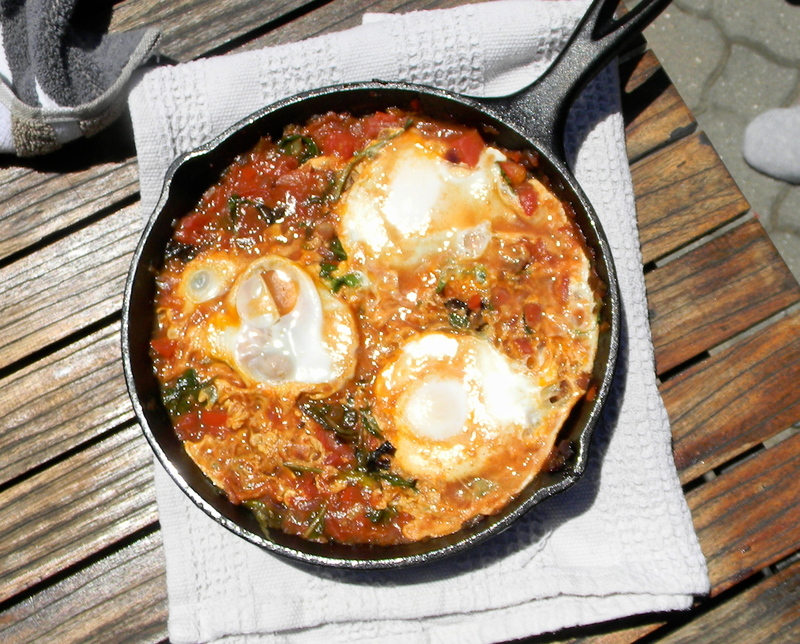 Give this shakshuka a shot, it is really amazing. 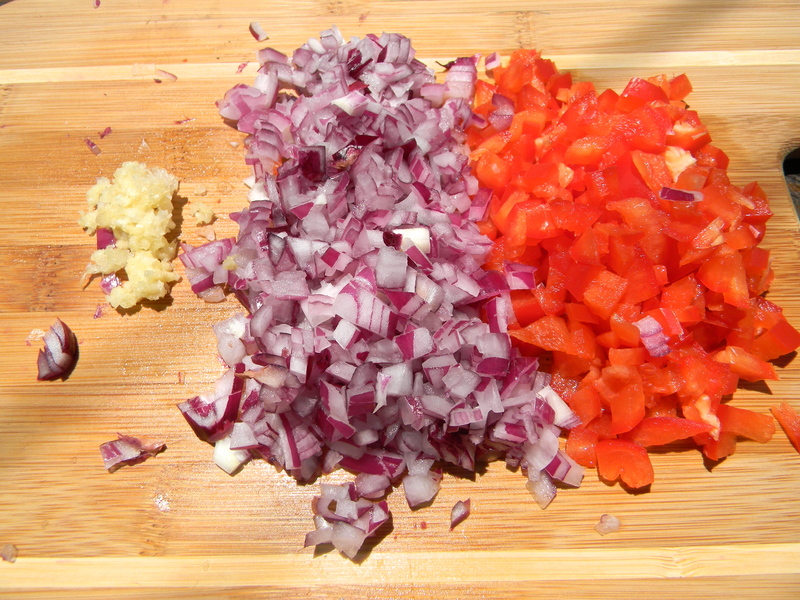 Finely chop bell pepper, onion, and garlic. If using the bacon, dice bacon and cook in pan until crispy. Remove the bacon and set aside. Pour out any excess bacon fat, leaving ~2 tsp for cooking. This will be your cooking oil if using bacon, if not add ~1tbs olive oil to the pan and add some red chili flakes to season the oil. Sauté bell pepper, onion, and garlic on medium to low heat for ~10-15 minutes or until the onions are caramelized and the bell peppers are broken down. Add spices at this point and season with a small amount of salt. (bacon has a lot of sodium, so be careful here). Sauté for ~1-2 minutes. Pour in diced tomatoes and cook until sauce starts bubbling and comes to soft boil (watch out for splattering) on medium heat. 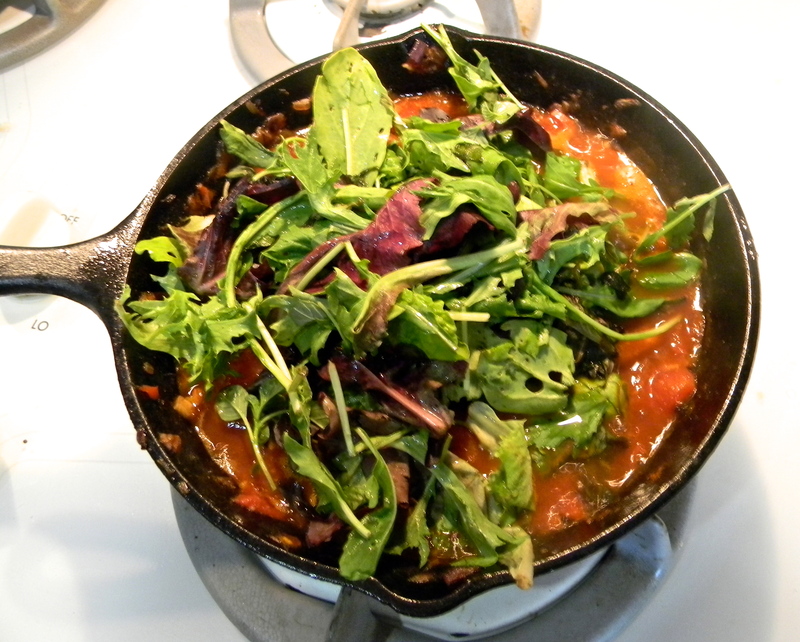 Turn down heat and add fresh greens. Mix until greens are wilted but remain bright green. If using bacon, add the bacon bits back in at this point. Using a spatula/wooden spoon, make 3 small holes or indentations in the tomato sauce. 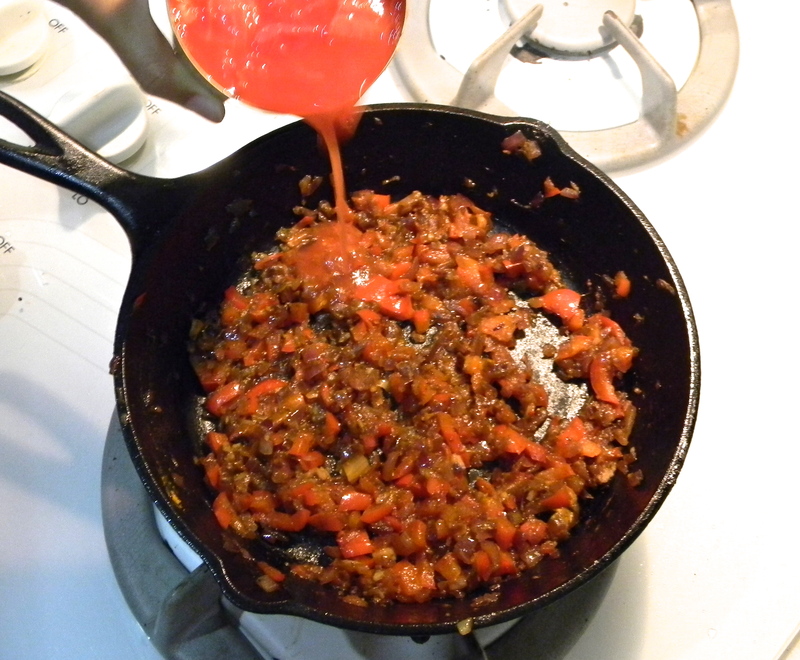 The sauce liquid will cover the holes, but the idea is to get the large tomato chunks out of the way. Crack the 3 eggs into individual holes. Cover and cook for 6-8 minutes depending on preferred egg yolk consistency. (6 for runny, 8/9 for a more set yolk). Make sure the sauce has come to a boil again before adding eggs. Sprinkle with feta cheese if desired and serve with pita bread, rice, or on its own.